On Top of the World is back on top of the most-popular list. Because the world of active adult communities constantly evolves and changes, 55places.com announces the 100 most popular active adult communities every year. However, it can also change every month. As 2018 came to a close, we decided to find out which communities had the most popularity at the end of the year. We took a look at 55places.com traffic between December 1 and December 31 to determine the ten communities that received the most visits overall. You might recognize many of these names, as they’re among the most popular communities in the nation, but a few of the results might surprise you. In December, we found On Top of the World at the top of our list—and for good reason. With 10,000 planned homes, this sought-after community strives to provide residents with every convenience and luxury they need. Homeowners can even participate in over 175 organized clubs that keep them physically and socially active, from pickleball and bowling to gardening and traveling. As long as active adults are considering buying their next home in Central Florida, OTOW will remain a community of high interest. Even though Latitude Margaritaville Daytona Beach earned the top spot on this list last month and led our list of the 100 most popular active adult communities in 2018, plenty of homebuyers still want to see what this community’s all about. Planned amenities include a town square with live music, a resort-style pool, and a private beachfront club on the Atlantic Ocean. It seems that many active adult buyers want to stay up-to-date on any new information about the progress of this island-inspired community. As one of the first 55+ active adult community in the country, Sun City now includes over 26,000 homes, 11 golf courses, and countless amenities and social clubs worth exploring. Homebuyers continue to flock to Sun City for its incredible home values, low property taxes, and minimal homeowners association fees. Desirable amenities include golf courses, indoor and outdoor swimming pools, fishing lakes, and a performing arts center. On any day of the year, it is common to see residents walking on the miles of trails or socializing with friends. 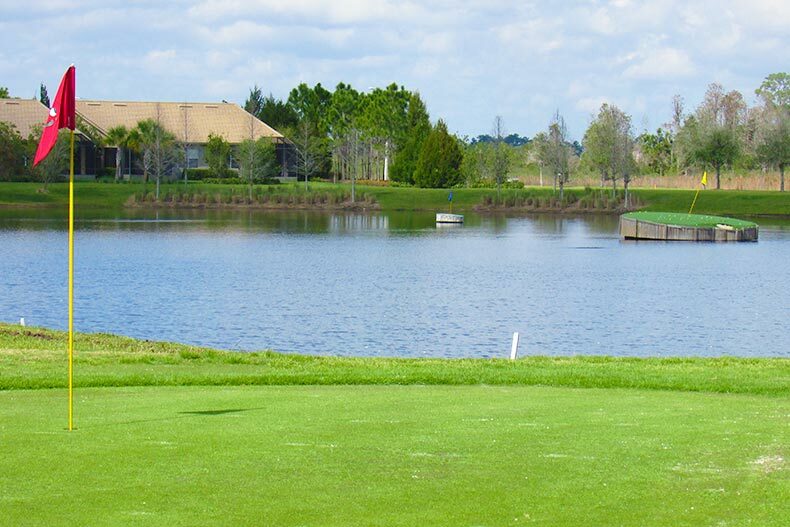 Living at Solivita in Kissimmee provides plenty of relaxation as well as some fun challenges. Just 13 miles west of the famous Hilton Head Island, residents of this Sun City community are never too far from the beach. If the humid, subtropical climate of Bluffton isn’t enough, this sought-after community offers a bountiful lineup of amenities, such as 54 holes of golf, indoor and outdoor pools, and a cushioned-floor aerobics studio. Active adults who want to enjoy their leisure time will find plenty to do in the surrounding area, including shopping, dining, and nightlife. Located in the Tampa Bay area, the age-restricted Sun City Center community stands out for its variety of amenities and lifestyle activities. Residents can enjoy a 97,000-square-foot clubhouse, indoor and outdoor pools, arts and crafts studios, and more, all accessible by golf cart. Active adults can also play golf, tennis, pickleball, volleyball, and softball under skies filled with sunshine on more than 300 days each year. Many 55+ buyers who want to get the most out of life appreciate all this community offers. Oak Run offers an ideal blend of large community amenities with a small, close-knit neighborhood feel. This established 55+ community offers reasonably priced resale homes and a robust lifestyle offering with over 100 clubs and interest groups. Residents love the six pools throughout this community, from a heated indoor pool to an outdoor Olympic-size pool. Tennis, shuffleboard, golfing, and more also keep active adults busy outside. Downtown Ocala has a lot of great shops and several delightful dining establishments worth exploring. The largest active adult community in Nevada, Sun City Summerlin, contains 7,779 homes. This master-planned Del Webb community comes with all the bells and whistles active adults have come to expect from Sun City communities. Three golf courses, three restaurants, and four clubhouses provide a vast array of world-class amenities always within reach for its residents. Sun City even has its own cultural center, the 312-seat Starbright Theatre, which plays host to many popular theatrical and musical performances as well as movies and guest speakers. Active adults must have been dreaming of The Sunshine State in December because this is the seventh Florida community to make our list. 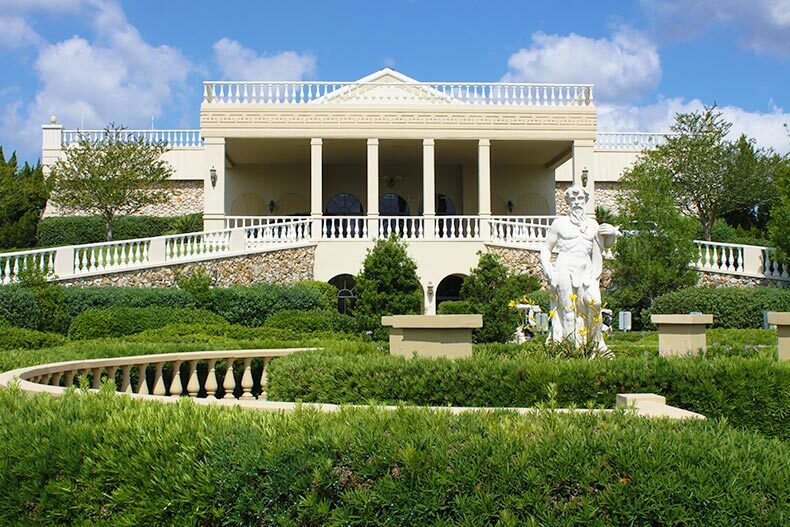 Kings Point is a gated active adult neighborhood in Sun City Center, Florida. This affordable community still provides many entertaining amenities, such as the 90,000-square-foot clubhouse with an indoor and outdoor pool and spa, exercise rooms, a bingo hall, and a cafe. Active adults searching for an age-restricted community near the beach seem to find a lot to love about Kings Point.